Visto en eShow Madrid. De todos los carteles es el que más captó mi atención. Seen at the eShow in Madrid. 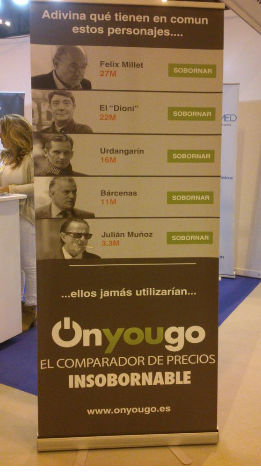 The poster shows a series of infamous Spanish figures that paid bribes by grossly overpaying fair market price for contracts. The ad muses ironically that these guys would never use the onyougo price comparison service! Of all the posters at the show this is the one that most caught my attention.